1.1. The famous treasure of Nagy-Szentmiklós was found exactly two hundred years ago, in 1799. It consists of 23 gold bowls, dishes, jars, and cups, and belongs now to the exposition of the Kunsthistorisches Museum in Vienna. It was found in Banat, near the village of Nagy-Szentmiklós (today Sînnicolau Mare, to the north-west of Temesvár-Timişoara). The detailed description of the treasure and the history of studies is given in László, Rácz 1983; see also an ample bibliography compiled by Mária Ivanics (in Göbl, Róna-Tas 1995: 59-77). There are no direct indications for dating and attribution of the objects. Most estimates place them in the period between the 5th and the 10th centuries, the first half of the 9th century being the most wide-spread (and still, rather likely then proven) dating, see Róna-Tas 1990: 9; in his more recent publication András Róna-Tas (1997: 110) gives however preference to the second half of the 8th century . Therefore the treasure is usually referred to as “Avar” or “Late Avar”, sometimes also as “Protobulgarian” (e.g. Mavrodinov 1943 as well as later literature from Bulgaria). This, however, does not necessarily characterise its provenance: as far as analogues to goldsmiths’ work, vessel forms, pictorial representations, and ornamental motives are concerned, references has been made to the Carpathian basin and to the entire Eurasian steppe zone, to Byzantium and to Southern Europe, to the Caucasus and to Iran. 1.2. The objects belonging to this treasure have inscriptions of three kinds which received recently a detailed palaeographic analysis in Göbl, Róna-Tas 1995. An inscription in Greek (the reading of which remains non-unproblematic, see Vékony 1973) is repeated twice on two paired bowls. The famous “Buyla inscription” (Inscr. 17 on buckled bowl [Schnallenschale] XXI) is written also with Greek letters, but in a non-Greek language. 13 objects have short inscriptions written with an unknown script of the “runiform” type. 1. A very late (not before the 12th century) dating of the treasure suggested by Hugo Mötefindt (1925) found no support in further research. were not made by the same hand and therefore may originate from different (geographically as well as chronologically) artisan shops - as well as the gold objects themselves. “Die einzelnen Stücke des Schatzes stammen sicher aus ver- schiedenen Zeiten. [...] Die griechische Schrïft des in griechischer Sprache geschriebenen Textes und die der Buyla-Inschrift sind paläographisch sehr weit voneinander entfernt” (Róna-Tas 1990: 10; see also László, Rácz 1983: 176-180; Göbl, Róna-Tas 1995: 29, 33-35). It is therefore permissible to restrict here the discourse to only one inscription, which always attracted more attention than the others. 2.1. The merger of η and ι, abundantly attested in post-classical Greek, has never been complete and universal (the archaic pronunciation of η as ē survives even in the Pontic dialects of Modern Greek). In the Byzantine period a trend can be observed - maybe due to learned efforts - to use in foreign names η for rendering a stressed (long) vowel, and ι for rendering an unstressed (short) one. See Debrunner 1954: 103-104 (“in nachchristlicher Zeit scheint ī die herrschende Aussprache [des η] geworden zu sein”) and Schwyzer 1939: 185-186, as well as the material in Moravcsik 1958. Therefore the presence of both symbols η and ι in the Buyla inscription may raise suspects that they rendered two quantitatively (or even qualitatively?) different vowels (cf. below 4.3.3). On the other hand, this may be a variation like that of οα and ωα, ε and αι in other words of the same inscription. 2.2. Another post-classical and especially Modem Greek feature, the pronunciation of γ as j before ι η ε, has been taken into consideration for the reading of the Buyla inscription by Marcel Erdal (1988) and András Róna-Tas (1990) though disregarded in other deciphering attempts. The issue seems to be controversial. Gyula Moravcsik (1958: 32) accepts the reading γ = j before palatal vowels for Turkic glosses in Byzantine sources (most of which are however younger than the Buyla inscription), but he also mentions very late examples where γ even in this position obviously stands for g (Γεμήσι καπί = Γκεμὶ καπισί 16th c. = Turk. Gemi qapïsï ‘ship gate’, ορταγή 1453 = Turk. ortaγï ‘his companion’ ; ibid. 32, 114, 22). Numerous other facts (e.g. the usual rendering of γ as g in Slavic words and proper names of Greek origin, as well as the onomastic materials collected in Свод... 1995) leave no doubt that the preservation of the non-palatal γ was, at least as a feature of learned pronunciation, absolutely possible throughout the Middle Greek times and that therefore the letter sequences γε, γη could be freely used for rendering foreign ge or gi. Additionally, there always existed an opportunity of rendering a foreign intervocalic j with (as in Βαϊανὸς = Bulg. Bajan [ibid. 228-229] etc.). Therefore the traditional reading of all gammas in the Buyla inscription as “g’s” (or aspirated “γ’s”) must be considered much more probable than the new suggestion. Le zoapan Bouila a achevé la coupe, (cette) coupe à boire qui par le zoapan Boutaoul a été adaptée a être suspendue (Thomsen 1917: 24). Der Zoapan Buila hat graviert den Kampf, der Zoapan Butaul hat das innere Kreuz graviert (Mladenov 1927: 335). Die Schale des Boila Čaban, in seinem Auftrag wurde sie ausgeführt; Botaul Čaban hat ihr die Schnalle machen lassen, seine Trinkschale ist sie (Németh 1932a: 1; cf. also 1932b : 10, 1972: 13). (paraphrased) Der Buila čupan tayši hätte hiernach seinem älteren Bruder (ičikä), dem himmlischen erhabenen Prinzen (täŋrogi tayši), diese Schale geweiht (Haussig 1985: 30). It is Buyla Žoapan who carries the bowl. Drinking bowl, made by But Aul Žoapan (Erdal 1988: 233). Die Burg des Buyla župan werde ich bauen lassen. (Ich,) Butaul župan, werde die innere Burg (zu bauen) anfangen (Róna-Tas 1990: 27). 2. This example is especially important due to the likeness of spellings between ορταγή and ταγρογη from the Buyla inscription. itself  and constructing a Turkic idiom with otherwise unattested (and sometimes hardly imaginable) combination of phonetic, grammatical and lexical peculiarities. The detailed analysis of weak points in these interpretations is hardly necessary: they obviously contradict and disnabilitate each other, and the fact that A. Róna-Tas in his summary report from 1995 refrained from supporting any of the versions (including his own) is enough eloquent. The idea that the language of the Buyla inscription is Turkic remains natural and attractive (taking the history of the corresponding area into consideration), but it repeatedly leads the studies to a deadlock. 4.1. The inscription includes three words with the same ending -gi (-ji ?) preceded by a vowel: ΔΥΓΕΤΟΙΓΗ, ΤΑΓΡΟΓΗ, ΗΤΖΙΓΗ. It is natural to assume that all three stand in the same grammatical form and fulfill the same syntactic function, most likely the predicative one; so one must think of languages which have this or a similar ending. This observation is not new (cf. already Keil 1888, cited after Göbl, Róna-Tas 1995: 14). However, this circumstance could not be taken into consideration in the numerous attempts to decipher the text: the Turkic languages do not know an ending like -Vgi in systematic grammatical use. 3. It is almost universally assumed that the engraver - poor devil! - knew neither the Turkic language nor the Greek script, and that nobody possessing this knowledge cared to control his work. The entire philological experience proves, however, that assumptions of that kind (and they occur, regretfully, too frequently) signalise only the inadequacy of interpretations - not of the texts in question. 4. Incidentally, through the intermediary stage *-ra-jī etc. ; this contraction, which affected all Tungus-Manchurian languages, must have occurred quite early. This means that even the interpretation of all -ΓΗ in the inscription as -ji or -jī (see 2.2) remains compatible with the Tungus-Manchurian reading suggested here. (Суник 1962: 223); Evenki (dial.) emerī ‘coming, приход', emerīw ‘I have come, я недавно пришел’ (ERSl 706). It is qualified as nominal aorist form (Benzing), as present participle serving as the base for finite forms of the (immediate) past tense (Sunik), etc. Below it is referred to as (predicative) participial aorist or (attributive) aorist participle. b) according to the dominant model of Ancient Turkic (as well as Modern Turkic) patronyms, one could expect the construction ‘Bota’s son’ to include the possessive form oγli, oγlu rather than the absolute form oγul (ul); this second model of patronyms (represented e.g. by the Tuvinian names in -ool) is - according to Peter Zieme’s personal communication (March 1999) - either very scarcely attested or even totally absent from Ancient Turkic sources. On the other hand, the name ΒΟΥΤΑΟΥΛ shows striking similarity to the typical masculine proper names in -wul which are wide spread in Evenki (Guriwul, Berkewul, etc., cf. ERSl 748). If the name in question sounded Butawul, the absence of a special letter for -w- before -u- in its rendering with Greek letters is expectable. One can naturally only guess about the meaning of the stem Buta-, but the TM languages provide us with at least one very likely explanation: *buta- ‘to hunt, to fish’ (TMS 1: 108, attested in Juchen, Manchu, Nanai, Ulcha, Udehe, and Oroch), hence Butawul ‘Hunter, Fisher’. Cf. Also the Evenki clan name Buta ~ Butan (Василевич 1969: 265). 4.3. The above considerations can be regarded only as indicative, but by no means decisive. The crucial moment consists, in my opinion, in the fact that after “extracting” the presumable endings of participial aorist from ΔΥΓΕΤΟΙΓΗ, TΑΓΡΟΓΗ, ΗΤΖΙΓΗ one easily and immediately recognises three verbal stems which: (a) are attested throughout the Tungus-Manchurian family and occur in many sources dealing with the Proto-Tungus-Manchurian reconstruction; (b) form together a uniform and relatively transparent semantic context. and supervised - in other words, behave like regional leaders of all times and are involved into normal political and administrative activities . The TM stem *ǯüge- (perf. ), *ǯüget- (imperf.) ‘to change, to exchange, to replace’ (TMS 1: 270) is well attested in most languages, e.g. as Evenki ǯuget-, Orok du(w)e-li-, etc. The form of 3 Sg. of participial aorist of the imperfective stem: *ǯügettegī or *ǯügetegī < *ǯüget-regī. In Manchu, where this stem is not preserved, the development *ǯü- > dü- (> Late Manchu du-) could be expected, as in the Orok form of this stem or in Manchu duksi ‘bilberry, whortleberry’ < TM *ǯüxi-kte- (Цинциус 1949: 211; Benzing 1955: 36, 42). The phonetic development *ǯ > d occurs also in other TM languages (systematically, however, only in Orok). Another process that is not uncommon in TM is the weak labial attraction (Benzing 1955: 20), which could produce the effect *ä > ö (ü) after the labial vowel of the first syllable. Therefore the spelling ΔΥΓΕΤΟΙΓΗ may render not directly the proto-form like *ǯüget(t)egī , but rather its dialectal developments like °düget(t)egī, °düget(t)ögī, °düget(t)ügī resp. (with shortened end vowel) °düget(t)egi, °düget(t)ögi, °düget(t)ügi, being transcriptionally exact. The reconstruction of TM *tāgragī ‘recognition, (has) recognised’ raises no doubts. One may perhaps speculate on the phonetic reasons of rendering the long ā in the first syllable with A, and of the short a in the second syllable with O (the first type of rendering occurs also in ΒΟΥΗΛΑ, ΖΟΑΠΑΝ ~ ΖΩΑΠΑΝ, ΒΟΥΤΑΟΥΛ). An explanation that lies close at hand consists in assuming that the Tungus-Manchurian language of the inscription was (partly) affected by the phonetic development which was in the 8th and 9th centuries gradually spreading through the Proto-Slavic dialect continuum: the change of *ā to a and of *ă to o. The symbiosis with the Early Slavs (see the rich literature on the issues of the Avar-Slavic relationships) could in principle be responsible for the penetration of this phonetic innovation also in the language of the Buyla inscription. 5. Rather than into producing, engraving, and buckling bowls (as it is suggested by most popular versions of reading the inscription in Turkic). 6. In this case we were to assume the rendering of ʒü with ΔΥ (dü) - which looks by no means impossible. may bear testimony to the archaicity of the corresponding stem without the final vowel. If so, the expected form of the participial aorist could have been (with assimilation) °iččegī, (after degemination) °ičegī and even (with attraction/assimilation of vowels) °ičigī. It can be even assumed that the spelling ΗΤΖΙΓΗ correctly renders stressed character and length of the initial and final vowels as opposed to shortness of the medial vowel (cf. 2.1 on the usage of η and ι). 5.1. The proper names and titles in the Buyla inscriptions have always been more or less clear. My suggestion concerning the presumably Tungus-Manchurian origin of the name ΒΟΥΤΑΟΥΛ has been formulated above (4.2). Perhaps it were possible to find a tentative TM etymology also for the name ΒΟΥΗΛΑ, but this is hardly necessary: on the one hand, it received a most persuasive treatment in Göbl, Róna-Tas 1995: 22-23 and, on the other hand, it must not and cannot be expected that personal names belong either to the language of the name-bearers or to the language of the document mentioning these names (cf. ibid. 23) . The title zhupan (in its different phonetic version) was in the last centuries of the 1st mill., and remained afterwards, so wide spread in the Carpathian basin and adjoining lands that additional comments to the word ΖΟΑΠΑΝ, ΖΩΑΠΑΝ are also hardly necessary (see ibid. 24-25 as well as rich etymological literature devoted to this title, e.g. Zett 1975 and Goląb 1986). The only striking circumstance consists in the Greek spelling with -οα-, -ωα-: one could rather expect this word to be spelled with ου, ω, or ο, as in numerous other Greek renderings of the same title (see Moravcsik 1958: 131-132). As long as otherwise the Greek transliteration seems to be very exact, it can be suspected that this unique spelling renders the pronunciation of the title in the language of the inscription. And, if so, its first part can be tentatively compared with TM *ǯu(w)a(n) ‘ten’ (Benzing 1955: 26, 101; TMS 1: 248), Nanai ǯoã, ǯoa(n-) id., Manchu ǯuwanda ‘foreman (in a group of ten units or persons)’. If a plausible Tungus-Manchurian source also for the second part -pan can be found (my search in this direction remained fruitless), this comparison may constitute a sound alternative to other suggested etymological treatments of zhupan (to Slavic župa ‘district’ - unless this word is not itself a back formation from the title, etc.). If not, this comparison may explain the folk-etymological phonetic change underwent by the foreign title zhupan in the language of the Buyla inscription. 5.2. ΤΕΣΗ, ΤΑΙΣΗ (the identification of both spellings is a commonplace of former studies, and I do not see any need to reject this tradition). 7. An additional consideration: at least one of the resulting interpretations of the text (see below, 6.3) suggests that it was Buta(w)ul, but not necessarily also Buyla, whose native language was a Tungus-Manchurian idiom. identification in the lexical material of contemporary Tungus-Manchurian languages. Still, I venture to suggest a solution which is by no means the sole one - but looks very probable. The TM verbal stem *teg(e)- ‘to sit down’ (Ev. tege- etc, see Benzing 1955: 30 as *tägä-; TMS 2: 226-8; Старостин 1991: 214 as *tege-) is attested as Manchu te- with the meanings ‘to sit, to sit down; to sit enthroned; to hold a post, a seat’ (‘сидеть, садиться, восседать; занимать должность, место’). The “administrative” meaning of this stem is evidently archaic, perhaps even common TM, as evidenced by the following derivative of *teg(e)-: Evenki tegemēr, Even taγəmer / taγəmēr / tegemér, Orok teγemeri ‘tsar’ (TMS 2: 228) . In Manchu this (or a similar) derivative is, according to TMS, not attested - a fact that can hardly be surprising, because all political terminology of this language consists of Chinese and Mongolian loan-words. However, the most commonly used suffix of nomina agentis in Manchu is -si (adulasi ‘herdsman’ from adula- ‘to graze’, medesi ‘messenger’ from mede ‘message’, učulesi ‘singer’ from učule- ‘to sing’, etc; s. Болдырев 1987: 55). That determines the semantic transparency and derivational plausibility of the non-attested °tesi ‘king, monarch’ (or maybe only ‘seat-holder, high-ranked person’), semantically parallel to Evenki teγemēr, in a TM language relatively close to Manchu . The fact that, similar to the title zhupan, the word in question is repeated in the inscription twice strengthens the probability of treating it as another title. (the quotation marks signalise that the “king” may be actually any privileged person, from a senior district official up to the Byzantine basileus, the Emperor of the Franks, or the Avar khaghan). The absence of grammatical markers (with the exception of the verbal / participial ones) makes the syntactic roles of individual words unclear. This is a most serious obstacle to understanding the text unequivocally. 8. It is worth mention that the same semantic derivation is attested also in Selkup, a language with a long history of Tungus-Manchurian influences: Selkup (Taz) ‘tsar, king’, derived from ‘to sit’. 9. I must mention, however, a phonetic problem that arises in connection with this explanation: one must assume the early loss of intervocalic (or stem-final) -g- in *teg(e)-, while in other cases the language of the Buyla inscription seems to have preserved this consonant (see above). It can only be remarked that problems of that kind frequently accompany the attempts to give an accurate description of the reflexes of “weak” consonants in Tungus-Manchurian (and in other Altaic, as well as non-Altaic) languages. Just one example: TM *daga ‘roof is attested in Negidal as dā, though normally -g- is preserved here (TM *daga ‘near’ > Negidal daγa). This reading is perhaps the simplest one. However, I can hardly imagine a situation when such a message should be engraved on a gold bowl (for whom?) rather than announced through horse-riding heralds, etc. Zhupan Buyla, (the) “king”, (is) replaced. Zhupan Butaul (is the) recognised (and) supervised “king”. I am, however, inclined to reject this version as long as the aorist participles in *-ra-gī are normally employed in the Tungus-Manchurian languages as active participles (unless the verb itself is supplied with a passive marker). (A) Though all Tungus-Manchurian languages inherit the object (accusative) marker *ba, its usage is in the Southern group non-obligatory, especially with indefinite objects (Benzing 1955: 79). V. A. Avrorin in his book on Nanai syntax devoted a big chapter to nominative objects, indicating that in some texts they occur as frequently as the accusative ones (Аврорин 1981: 151-158). (B) Though the canonical word order in the Tungus-Manchurian languages is SOV, all grammatical descriptions as well as texts indicate ample possibilities of deviating from this word order in emphatic construction. The text of the Buyla inscription can be expected to be declarative (with an emphasis) rather than narrative. (C) If the Buyla inscription is a translation from some other language (e.g., from Greek, from Slavic), it can be expected to be a word-for-word rendering of the original text, with the non-Tungus-Manchurian (or untypical) syntax preserved. 10. There are numeral examples of such syntactic constructions in Evenki (Колесникова 1966: 119), in Nanai (Аврорин 1981: 93ff.) and in other Tungus-Manchurian languages. The basileus has displaced (or: displaces) Buyla as zhupan. The basileus has recognised and supervised (or: recognises and supervises) Butaul as (the new) zhupan. The basileus declares the displacement of Buyla as zhupan. The basileus declares his recognition and watch over Butaul as (the new) zhupan. Such a text may be authentic, though syntactically aberrant (from the viewpoint of dominating syntactic models in the contemporary Tungus-Manchurian languages). Even more likely, it can be a word-for-word translation from an Indo-European language with a free word order - for example, the translation of the text which corresponds syntactically to the following, syntactically adequate, Russian text: Буйлу-жупана император сменяет. Бутаула-жупана признает и контролирует император. It is this last reading version that produces perhaps the most plausible scenario, explaining also the circumstances under which the Buyla inscription came into being: After a political change in the southern part of the Avar khaghanate, which could have occurred even without any direct Byzantine participation, Constantinople seeks the ways to reaffirm its (formal rather than real) sovereignty over the region and to strengthen the ties to the new zhupan Butaul. The latter is therefore presented with a gold bowl (and possibly other gold objects belonging to the treasure of Nagy-Szentmiklós). An inscription engraved on the bowl serves as the act of diplomatic recognition on the basileus’ side. As a token of special respect, this inscription is translated into Butaul’s native language . 11. The weak point of this scenario lies in the fact that, according to S. A. Ivanov (personal communication, February 2000), the use of “barbarian” languages was most uncommon in the Byzantine diplomatic practice. Normally the “respect” to a barbarian was expressed by addressing him in Greek. dependence/sovereignty, was never quite clear even to the contemporaries - to say nothing about the modem historians. Both suggestions remain however within the limits delineated by the previous studies on the treasure from Nagy-Szentmiklós. 6.4. It goes without saying that the above three versions do not exhaust the possibilities of interpreting the Tungus-Manchurian text, and especially of speculating on its possible historical connotations. 7. The assumption that a Tungus-Manchurian idiom was spoken in the Carpathian basin in the Avar times is naturally a much more serious claim. 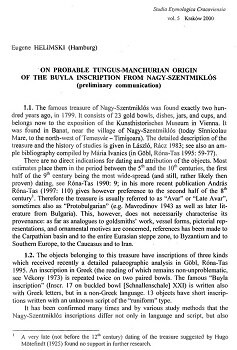 It must be stressed, however, that: (a) neither Turkic nor Mongolic origin of the Avars has been until now proven; (b) according to the wide-spread view, the Avar tribal confederation was not linguistically uniform ; (c) the Tungus-Manchurian affiliation of the language of the Buyla inscription certainly does not suggest that this was the only or the dominating language of the Avars. Another, and extremely important, piece of evidence must necessarily be mentioned in this connection. István Futaky in two articles (1970, 1973) indicated the probable borrowings from Tungus-Manchurian into Hungarian, and at least four of his etymologies (for Hung. beteg ‘ill’, oldal ‘side’, hamar ‘quickly’, kanál ‘spoon’) appear to be faultless . One can see here another trace of the Tungus-Manchurian presence in the Carpathian basin, or at least far enough in the West to reach the Proto-Hungarians. 7.1. The language of the Buyla inscription appears to be relatively close to the Proto-Tungus-Manchurian - closer anyhow than to any of the later or contemporary daughter idioms, though some features can be viewed as Southern Tungus-Manchurian or even Early Manchu. This agrees with the relatively late dating of the dissolution of the Tungus-Manchurian unity (first half or middle of the 1st mill.) which the author assumed in some previous studies (see e.g. Хелимский 1985:210). 7.2. If the above assumptions concerning the Buyla inscription are correct, both the person who prepared the Greek transliteration and the goldsmith who engraved it deserve our gratitude: the text contains no misspellings and needs no amendments. 12. “It should hardly be surprising that the European Avars were an entirely mixed tribal confederation, with an Inner Asian core, in which a number of Altaic and non-Altaic languages were spoken” (Golden 1992: 111). Cf. also Ligeti 1986; Goląb 1992: 394 ff. 13. The fact that they are not accepted in the contemporary Hungarian etymological lexicography is a problem of the latter - not of the quality of I. Futaky’s comparisons. I use this opportunity to express to István Futaky my gratitude for his valuable comments on this paper, some of which hopefully be incorporated into his monograph (in preparation) on Hungarian-Tungus and Hungarian-Mongol language connections. Аврорин, В. A. 1981. Синтаксические исследования по нанайскому языку. Ленинград. Benzing, J, 1955. Die tungusischen Sprachen: Versuch einer vergleichenden Grammatik (= Akad. der Wiss. und der Literatur in Mainz. Abh. der geistes- und sozialwissenschaftlichen Klasse, Jg. 1955, Nr. 11). Wiesbaden. Болдырев, Б. В, 1987. Словообразование имен существительных в тунгусо-маньчжурских языках. Новосибирск. Цинциус, В. И. 1949. Сравнительная фонетика тунгусо-маньчжурских языков. Ленинград. Debrunner, А. 1954, Geschichte der griechischen Sprache. II. Grundfragen und Grundzüge des nachklassischen Griechisch. Berlin. Erdal, M. 1988. The Turkiс Nagy-Szent-Miklós Inscription in Greek Letters. - Acta Orientalia Hung. 42: 221 -234. ERSl = Василевич, Г. M. 1958. Эвенкийско-русский словарь. Москва. Futaky, I. 1970. Zur Frage der "altaischen" Lehnwörter im Ungarischen. - In: Congressus Tertius Internationalis Fenno-Ugristarum, Pars I. Tallinn. 587- 592. Futaky, I. 1973. Einige Aspekte zur Erforschung der uralisch-tungusischen Beziehungen. - In: Festschrift für Wolfgang Schlachter zum 65. Geburtstag. Göttingen. 25-34. Göbl, R. - Róna-Tas, А. 1995. Die Inschriften des Schatzes von Nagy-Szentmiklós: Eine paläographische Dokumentation. Wien. Goląb, Z. 1986. Slowianskie župa, županъ i gъpanъ na tle indoeuropejskim. - In: Collectanea Unguistica in honorem Adami Heinz (= Prače Komisji Językoznawsta 53). Wroclaw е. a. 1986. 57-64. Goląb, Z. 1992. The Origins of the Slavs: A Linguist''s View. Columbus, Ohio. Golden, Р. B. 1992. An Introduction to the History of the Turkic Peoples. Wiesbaden. Haussig, H.-W. 1985. Die Runen des Schatzes von Nagy-Szent Miklós in ihrer Bedeutung für die Runenschriften Osteuropas. - In: Röhrborn, K. & W. Veenker (Hrsg.). Runen, Tamgas und Graffiti aus Asien und Osteuropa (= Veröffentlichungen der Societas Uralo-Altaica 19). Wiesbaden. 18-52. Хелимский, E. A. 1985. Самодийско-тунгусские лексические связи и их этноисторические импликации. - In: Урало-алтаистика. Археология, этнография, язык. Новосибирск. 206-213. Janhunen, J. 1991. Material on Manchurian Khamnigan Evenhi (= Castrenianumin toimitteita 40). Helsinki. Keil, В. 1888. Die griechischen Inschriften im sog. Schatz von Attila. - Repertorium für Kunstwissenschaft 11: 256-261. Stuttgart. Колесникова, В. Д. 1966. Синтаксис эвенкийского языка. Москва - Ленинград. László, Gy. - Rácz, I. Der Goldschatz von Nagyszentmiklós. Budapest 1983 (original Hungarian edition: László, Gy. - Rácz, I. A nagyszentmiklósi kincs. Budapest 1977). Ligeti, L. 1986. A pannóniai avarok etnikuma és nyelve. - Magyar Nyelv 82: 129-151. Mavrodinov, N. 1943. Le trésor proto-bulgare de Nagy szentmiklós (= Archaeologia Hungarica XXIX). Budapest. Menges, K. H. 1943. The function and origin of the Tungus tense in -ra. - Language 19: 237-251. Mladenov, St. 1927. Zur Erklärung der sogenannten Buelainschrift des Goldschatzes von Nagy-Szent-Miklós. - Ungarische Jahrbücher 7: 331-337. Moravcsik, Gy. 1958. Byzantinoturcica II. Sprachreste der Türkvölker in den byzantinischen Quellen. 3. Aufl. (= Berliner byzantinistische Arbeiten 11). Berlin. Mötefind, H. 1925. Der Schatzfund von Nagyszentmiklós. - Ungarische Jahrbücher 5: 364-391. Németh, Gy. 1932a. Die Inschriften des Schatzes von Nagy-Szent-Miklós. Budapest-Leipzig. Németh, Gy. 1932b. A nagyszentmiklósi kincs feliratai (= A Magyar Nyelvtudományi Társaság Kiadványai 30. sz,). Budapest. Németh, Gy. 1972. The runiform inscriptions from Nagy-Szent-Miklós and the runiform scripts of Eastern Europe. - Acta Linguistica Hung. 21: 2-52. Róna-Tas, A. 1990. Die Inschrift des Nadelbehälters von Szarvas (Ungarn). - Ural-Aliaische Jahrbücher N.F. 9: 1-34. Róna-Tas, A. 1997. A honfoglaló magyar nép: Bevezetés a korai magyar történelem ismeretébe. 2. kiad. Budapest. Schwyzer, E. 1939. Griechische Grammatik. 1. Bd. (= Handbuch der Altertum- V«/issenschaft IS : I, 1). München. Старостин, С. А. 1991. Алтайская теория и происхождение японского языка. Москва. Суник, О. П. 1962. Глагол в тунгусо-маньчжурских языках. Москва-Ленинград. Свод древнейших письменных известий о славянах 1995. Сост. : С. А. Иванов, Г. Г. Литаврин, В. К. Ронин. Т. II (VII-IX вв.). Москва. Thomsen, V. 1917. Une inscription de la trouvaille d'or de Nagy-Szent-Miklós Hongrie). - In: V. Thomsen. Samlede Afhandlinger. III. København. 325-353. TMS = Цинциус, В. И. (ред.) 1975-1977. Сравнительный словарь тунгусо- маньчжурских языков. 1-2. Ленинград. Василевич Г. М. 1979. Эвенки: Историко-географические очерки (XVIII- начало XXв.). Ленинград. Vékony, G. 1973. Zur Lesung der griechischen Inschriften des Schatzes von Nagyszentmiklós. - Acta Archaeologica Hung., XXV: 293-306. Zeit, R. 1975. Über das Verhältnis vom slavisch und ungarisch župan - špan - ispán im Lichte der Wortgeographie. - Ural-Altaische Jahrbücher 47: 207- 216.